Shortboards gallor - Swallowtails, Roundtails, SemiGuns and Guns - 2, 3 and 4 fins - new boards are available in the factory shop ready to be viewed in person or shipped to you worldwide. Board sizes and models below are guidelines - custom orders are tailored to meet your specific requirements, wave and experience. Swallow tail-featues a hip in the tail to a small swallow.Mid to low rocker.Single or single to double concave. Bit of tail vee in bigger guys' boards. A fast fast fast board. Low rocker, concave, slightly more parallel outline with a baby fish tail. Loves to go fast in slow waves. 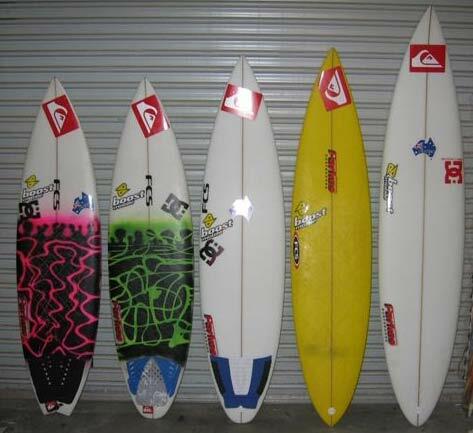 All size ranges groms to big guys. single to double concave or full single. Great for quick, small arc turns in the pocket and likes hollower waves. A little longer and curvier if you want it for a semi gun. Pintail gun, for proper waves with size, tubes and walls.Think control in heavy conditions/surf. By purchasing a board from David Parkes you are buying a personally tested design with over 26 years of shaping experience behind it. If you want your grommet to have the best, check out the new GPS lines, a collaboration between Dave Parkes and the 2007 ISA Quiksilver World Junior Champion (under 16's), Garrett Parkes!